I keep giving them to my friends. They are all wine collectors with older established cellars. The Durand is the best thing that ever happened to vintage wine! I tried The Durand over the weekend and it worked perfectly in a bottle of Chateau Palmer 1921, the corked was soaked all the way through, but still managed to get it out in one piece…and the wine was outstanding, so a great debut for my Durand! The Durand is invaluable! As a floor sommelier with some older offerings, I haven’t had any corks disintegrate from usage of the Durand, even some real mules which are notorious for making cork dust (50’s Bordeaux, late 60’s Napa) Thanks for the great product! There is no question that The Durand is the only tool to use for opening older wines. You guys definitely need one! 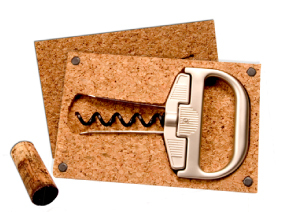 My advice is to keep your Durand handy when you want to make absolutely positive that the cork comes out clean. For my 50th birthday, we had a serious line-up, and The Durand helped us open every one without an issue. Spectacular performance, spectacular wines. The most venerable of them: Saint-Julien 1920, Château Gruaud Larose, Saint-Julien 1924, Château Léoville-Las Cases, Pauillac 1924, Château Pontet Canet. President, The Rare Wine Co. The Durand corkscrew is the greatest discovery since the cork itself. I am a new Durand owner, and used it successfully to open a bottle of 1945 Ch. Mouton Rothschild the other night. And at the end of the evening, it performed equally well on a bottle of 1925 Chambolle-Musigny from the Collection of Dr. Barolet. Many thanks for creating such an excellent device.